Despite some resurfacing at Winton Motor Raceway, record times recorded at the event last year are not expected to be matched. Unique factors combined for fast times at the 2014 event - an epoxy sealant was laid on the 3km circuit to patch up the cracking track, and reacting with the Dunlop soft tyre produced exceptional grip that led to V8 Supercars recording quicker times than had ever been seen at the circuit. There is no epoxy sealant this time around, and the cars will qualify on the Dunlop hard tyre compound, which is not as fast (but does not wear as quickly). Pre-marked soft tyres can be used in practice, and one new set is allocated for Sunday's race. Since last year, however, there has been resurfacing at turn five, turn 10 and mid-corner at turn 11 at the Winton circuit. Brad Jones Racing's duo Fabian Coulthard and Jason Bright netted the fastest times last year, Coulthard recording a 1min19.6538 lap during qualifying, and Bright a 1min22.5291 during the race. Both were on the soft tyre, and while Bright's was just 0.45sec faster than the standing race lap record set by Marcus Marshall in 2009, Coulthard's was a whopping 2.1sec quicker than Rick Kelly's qualifying record, previous set in 2010, also on the soft tyre. According to Coulthard's engineer Phil Keed - who engineered the driver to a win at Winton - there could be some small gains at the three corners, but times will be nothing like last year. Keed believes that at most, the surface change could offer two to three tenths of a second across a lap, though he hasn't specifically seen the changes yet. "As long as the surface has settled in, it'll be better grip," he told v8supercars.com.au. "Three corners out of 12 ... it might be good for a couple of tenths, I would've thought, so not a significant change in lap time. It might help the tyre wear slightly but I wouldn't expect a huge improvement because you do the damage where the grip is the least. So probably if it's a good surface, two to three tenths at the most." Keed said turns five and 10 had traditionally been bumpy - five is particularly tricky, and it's easy to go off-track there. Changes in track surface and conditions are something teams hunt for on their Thursday afternoon track walks, which fans often see on social media. "We're looking for new surfaces, broken tarmac, where it changes from old to new," Keed explained of the track walks. "The walk is just good focusing for everyone too, the drivers get a chance to talk through general plans for the weekend. "The 'newness' you usually find out in the first lap they turn [in the car] - but it's just a good opportunity to go through your plans and talk." Bright - who holds the race lap record andis equal for the most wins at the Victorian circuit -agrees the team will pay close attention to the track walk on Thursday. "Depending on how much has been done - whether it helps your corner speed, your braking, it's hard to say how much [or if] there will be a time gain - but once we do the track walk we'll have a better understanding," he said. With two hours of practice on Friday and another set of hard tyres granted for this round, Bright believes there will be enough time on track to assess the conditions and the car. "The [set of] tyres is going to be good. When you've done a lot of running on the Dunlop tyre, in qualifying you see quite a good lap time -but we're not going to see anything like last year." Coulthard praised his Freightliner crew's teamwork after his 24th to third place drive on Sunday in Perth, and Keed thinks some of the things the team learned over that weekend will transfer to Winton. Based on recent V8 Supercars Dunlop Series testing, he believed the circuit would be "typically Winton". "Perth went well for our team [and] Perth and Winton have some characteristics similar - high degradation, low-ish grip - so we feel quite excited after Perth, we felt we made some good gains." 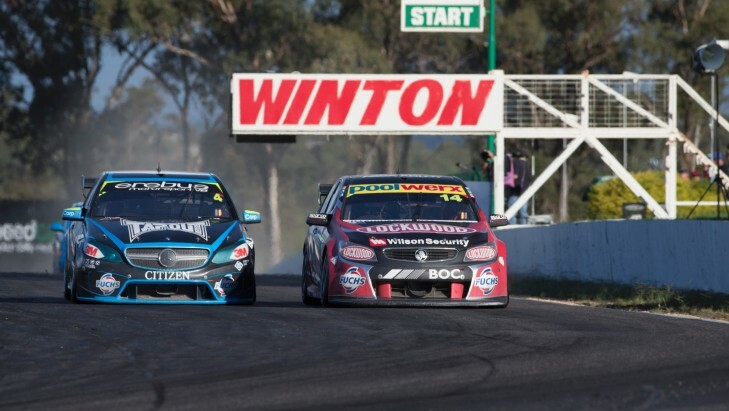 Other updates at Winton Motor Raceway ahead of this week's event include new tyre barriers for safety at the exit of turn four, as well as turns five-six; as well as a new debris fence at the exit of turn 12, which protects pit lane.